Do I really need another recreational hobby? With some hesitation as to whether it will 'stick', I have begun an interest in cycling. With the gas crisis, I longingly considered the motorcycle option, but my loving wife poured a huge bucket of cold water on that idea. 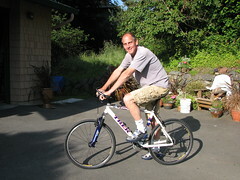 I have decided to give bicycling a try. We don't live in a setting conducive to bicycle commuting, but I enjoy a long ride for recreational purposes. I have been combing craigslist for the past couple of weeks, and last night I went down to Olympia and bought a nice used bike in great condition. It even came with clip-in shoes that are my size. I took my first ride to Manchester this evening-everything works great. On a more domestic note, I completed a small carpentry job for a neighbor and received my first summer pay check. woah, it must've be one GOOD deal to be worth driving down to Olympia in our current "gas crisis" to buy a bike! congrats on becoming a member of the cycling community. Your son is jealously reading your blog now.